Kick A Rock: What the hell ever happened to the movie Rad? Anybody who grew up in the 80s and 90s, rode a BMX bike or skateboard, and watched every BMX and skateboarding movie available, knows that we had some very cheesy films back then. And yet, I love sitting down and watching Thrashin&apos; and Gleaming the Cube every once and while. Hell I'll even sit and watch a 14 year old Nicole Kidman wave her pubic-like hair in the wind in the movie BMX Bandits. But I have one question. What the hell ever happened to the movie Rad? 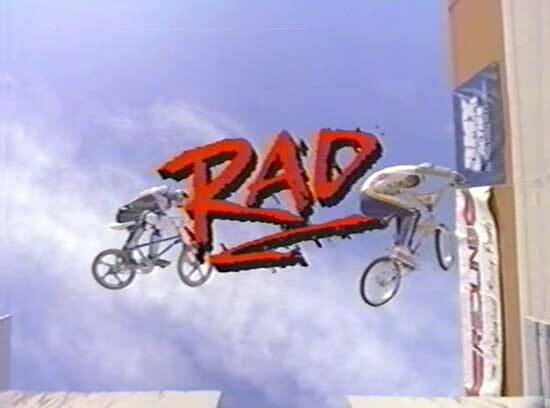 If you don't know, and I'm sure you don't, Rad was one of the best BMX movies ever made in the 80s. It even featured a young Lori Laughlin before she made it big as Becky in Full House. Oh, you know what I'm talkin' about. For years I've searched to find this movie on DVD. I've scoured Best Buys. I've browsed Amazon like nobody's business. But no matter what, I could never find this movie on DVD. So, in order to appease my desire to watch movies of my youth, I took the time to go to my parent's house, dig through the basement, and recover the VHS tape I owned when I was little. Hell, I even took the time to bust out an old VCR player, connect it to my computer and turn it into an MP4 so I could watch it on my AppleTV. That's right, I'm that dedicated to the film. So, now that all the work is done, I figured I'd share the fruits of my labor with all of those who've been dying to watch, once again, the tale of Cru Jones—a young man with the intensity and desire to win a BMX race called Helltrac! Things to know! First, umm, yeah, I don't think we're allowed to play this for you. But, you know what, maybe the owners of Rad will brighten up and actually sell it on DVD. Am I right, or what? Second, it'll only be up for about a week, so you better watch it now or you'll miss out. Last, but not least, because I couldn't use a licensed player, you have to deal with slow load time. Sorry about that, but if you really want to watch it, you'll have to be patient.